This April's Development Academy Spring Showcase represents the first-ever Academy event exclusively for girls. While over 3200 players will take part in 304 games over the course of the five-day event, an octet of feature showdowns highlight the massive slate of matches. All eight games will be played just outside of Greensboro, N.C. at Bryan Soccer Park's MacPherson Stadium and streamed live on ussoccerda.com, the Development Academy Facebook page and U.S. Soccer's YouTube channel. Here's a look at the final pair of feature match-ups to be played on Tuesday, April 10. Led by two elite goalkeepers, Legends FC and New York City FC are both chasing the top spot in their respective divisions. NYCFC 'keeper Julia Dohle and Legends FC net minder Clarissa Ramirez will use the feature game as their final competitive match before the CONCACAF Women's U-17 Championship in Nicaragua later this month. Dohle is a part of the recently-named USA roster for the event while Ramirez has been a consistent call-up for El Tri's U-17 side. Ramirez anchors the Legends' back line, but the dangerous attack is led by Laney Carroll and Lilli Rask. The duo both have picked up 15 goals this season, tied for fifth-best in the West Conference. Carroll organizes the front line with a high work rate, while Rask is the California club's best 1-v-1 player and can be counted on to create multiple chances per game. The two dangerous goalscorers are fed by attacking midfielder Chloe Rogon, called a "maestro" with the ball by the coaching staff. Her ability to probe the defense opens things up for Carroll and Rask. Another playmaker lines up behind Rogon in high-quality two-way midfielder Alex Day. The defense is highlighted by underage center back Courtney Boone, a recent U-15 Girls' National Team call-up and Kayla Colbert, the team's best 1-v-1 defender and another National Team pool player. Dohle isn't the only player with international experience on the NYC roster. Danielle Etienne was a key player for the Haiti U-20 team that qualified for the FIFA U-20 Women's World Cup this summer. Haiti's third-place game victory over Canada clinched the Caribbean nation its first-ever World Cup at any level. Angela Aguero paces the New York offense. She's scored 14 goals this season, good for sixth in the East Conference. Her nose for the net has earned her National Team call-ups. The Showcase's final feature fixture will see one of the Academy's best teams taking on another playoff-positioned side starting to round back into form. At 17-2-4, FC Dallas is the No. 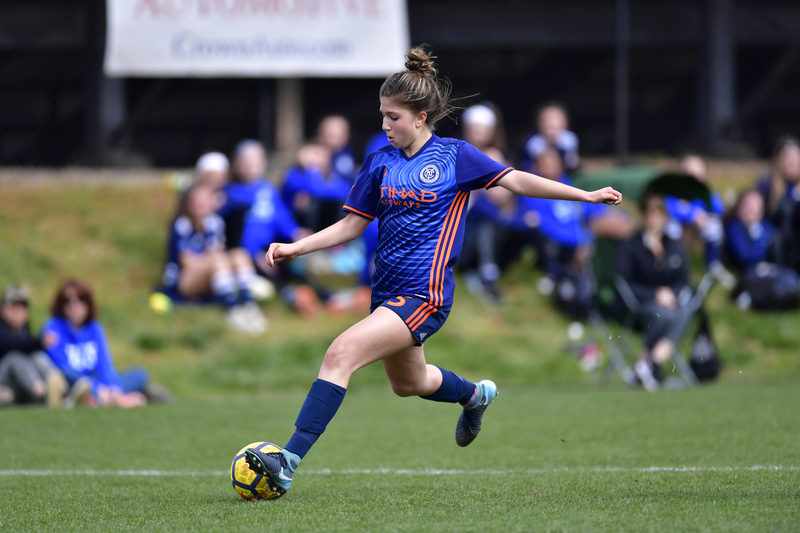 2 team in the league, while Penn Fusion, second in the Atlantic, has begun to find rhythm following a rough start to the spring season. One of the most noted producers of Boys' Academy talent, FC Dallas now brings the "FCD Way" and its world-class environment to the Girls' Academy. The Texas team's 2017-18 success is propelled by one of the Central Conference's top offenses, lead by forward Morganne Elkelbarner. Her 24 goals are good for third in the Academy. In the midfield, Jaedyn Shaw is one of the team's most talented players on the ball while Paige Dickson provides a creative cog in the attacking third. Though just a 2003 birth year player, goalkeeper Jordyn Gunnarson stands an intimidating six-foot in the net and has already caught the eye of college coaches. The scariest thing about the Dallas line-up: it's not at full strength. As players return from injury, FCD will try to make a run for the No. 1 seed in the Academy playoffs. Prior to the Showcase, Penn Fusion shook off some winter rust with three straight victories. Now in Greensboro, the club has dropped one match and drawn another. Looking to go home on a high note, the West Chester squad will look to get its attack going against FCD. Penn Fusion emphasizes quickness in transition and ball movement, and its possession-based play has created a balanced scoring load. Forward Zoe Schutter leads the squad with 11 scores and fellow forward Margaret Peterson is close behind with eight. Amanda Maxson and Lauren Stewart have been consistent starters for a stingy defense that ranks third in the East for goals against.